Toggle the Audio Links and Video Links tabs for detailed lists. On July 10, 2017, Sonia was interviewed by phone for about an hour by Angela Guzman for the Foremothers Oral History Project of the Virginia chapter of NOW. This archival project contains an oral history of the Second Wave of the Women's Movement, mostly in Virginia. In Aug. 2017, the interview went up on the website of Virginia NOW. On March 20, 2017, Minnah Stein recorded Sonia introducing herself and reading the introduction to her late brother, Hermann's, diary. That diary and Sonia's introduction to it appear on the website of the Museum of Family History. On Jan. 28, 2017, Sonia was interviewed by telephone for 27 minutes by Jennifer Cole, a 6th grade student in Folsom, CA. The interview, in connection with Jennifer's preparing a 10-minute documentary film, was about Betty Friedan, the founding of NOW, the growth of NOW, the EEOC's early actions vis-a-vis the gender discrimination provisions of Title VII of the Civil Rights Act of 1964, and related matters for a National History Day Competition. On Aug. 28, 2016, at 10:00 a.m., guest host Joan Lowery's 45-minute interview of Sonia was broadcast on radio program Milk & Honey, sponsored by the Jewish Federation of Sarasota-Manatee, on radio station WSRQ Talk Radio. Joan Lowery's interviews on Milk & Honey are Holocaust-related. On June 9, 2016, Sonia was interviewed by Fran Luck, executive producer, for six minutes on Joy of Resistance: Multicultural Feminist Radio on radio station WBAI, which broadcasts in NY, NJ, and CT. The purpose of the interview was to celebrate a first in American history: a woman's being chosen as the presumptive nominee for President by a major American political party. Radio interview (half hour) of Sonia, Nadine Smith, Jan Godown Annino, and Moses Jumper on WGCU-FM (the NPR station in Ft. Myers, FL) GulfCoast Live, by John Davis on Mar. 23, 2016. The purpose of the program was to let listeners know that three of the sixteen honorees honored by the National Women's History Project were Floridians: Sonia, Nadine Smith, and the late Betty Mae Tiger Jumper. When the page opens you will find a link called "Listen". That listen link will have a blue triangle. Click to listen or right click and choose "save link as" to save the file to your own computer. Sonia's 15-minute interview on "Joy of Resistance," a feminist radio program on WBAI, by the program's executive producer, Fran Luck, on July 2, 2014. This was part of an hour-long program commemorating the 50th anniversary of the passage of Title VII of the Civil Rights Act of 1964, which among other things, made it a violation of the law for employers, employment agencies, and labor unions to discriminate on the basis of gender. Forty-five-minute interview of Sonia by Susan Nilon on Sarasota radio station WSRQ on The Nilon Report, March 07, 2013. December 3, 2012, Interview of Sonia by Tyler Whitson, Sarasota reporter, on Sarasota community radio station WSLR with regard to her campaign to have Phyllis Schlafly deleted as a Groundbreaker for women’s rights on the Makers website, http://makers.com, and from the documentary film to be released by Makers on Feb. 26, 2013. Makers is funded by PBS, AOL, and WETA. This interview was not broadcast and is available only on this website. Deborah Carney’s interview of Sonia about feminism and her memoir, October 8, 2012. Interview on radio station WWPR, AM 1490, in Bradenton, FL, on the “Meet the Author” segment of Red Robyn Productions (September 14, 2012). Fifteen-minute interview of Sonia on blog radio program Dresser After Dark (July 6, 2012). Five-minute interview of Sonia by America’s Radio News (with 300 affiliate radio stations across the US) concerning the campaign Sonia initiated to protest the National Woman’s Party/Sewall-Belmont House & Museum’s plan to give the Alice Award, named for legendary feminist, Alice Paul, whom Sonia knew, to Laura Bush on September 19, 2012. April 22, 2012, interview of Sonia on Children’s Health & Fitness website. Maternally Yours, a one-hour panel discussion (with Sonia as one of two panelists) on Sarasota, FL, community radio station WSLR on April 17, 2012, on the employment rights of men and women under the law in connection with pregnancy and childbirth. Sonia was a panelist on China Radio International’s Today Show out of Beijing, March 9, 2012, discussing the fact that more than half of the births to American women under thirty occur outside marriage. February 2012, Women’s Information Network, fifteen-minute interview by Bonnie Ross-Parker. Interviewer’s voice fades in and out, but you can hear Sonia’s part fine. Interview by Cyrus Webb on the Conversations Live Internet radio program, February 4, 2012. Interview by Phil Fink, host of Radio-J, January 18, 2012, part 1. Interview by Phil Fink, host of Radio-J, January 18, 2012, part 2. Interview of Sonia by Lisa Bracken, host of Blog Talk Radio program, In-Depth Perception, Dec. 29, 2011. Interview by Don McCauley on The Authors Show (August 7, 2010). Interview by Sonia M. Gallagher, an attorney and executive coach for lawyers, as part of her series, “Lawyers as Change Agents” on her Lawyers Roundtable Show (July 21, 2010). One-hour interview, Oral History Collection, JFK Museum, Dallas, TX, Aug. 23, 2010. ©2010 The Sixth Floor Museum at Dealey Plaza. All rights reserved. www.jfk.org. "Women Helping Women," panel discussion with Sonia Pressman Fuentes, Meridith Gray, Suzanne Blake and Jessica Robinson (August 20, 2010). Interview on radio station TRN. The interviewer is Derrick Blair, Host of “Now It’s The News,” a nationally-syndicated satirical news program (Part One, July 17, 2010). Interview on radio station TRN. The interviewer is Derrick Blair, Host of “Now It’s The News,” a nationally-syndicated satirical news program (Part Two, July 17, 2010). Interview on Dresser After Dark radio show (July 15, 2010). Interview by Rob McConnell, host and executive producer of the XZone radio program based in Hamilton, Ontario, Canada (August 6, 2010). Interview by Jerry Puffer on KSEN—radio station 1150 AM out of Shelby, Montana (July 27, 2010). Lillian Brummet interview for blogtalkradio.com, June 20, 2010. Sonia's job hunting success story on How I Got My Job (December 2009). Sonia as a BBC Radio Four panelist (March 2009). Sonia's interview on Women Matters (October 10, 2009). Sonia's interview on Women Matters (September 23, 2008). Interview by Gretchen Orscheidt, Cornell alumni representative, about Sonia's experiences at Cornell (April 2008). Sonia's August 2007 interview (16 minutes) (in English) by Linda Jiménez Glassman, host of the English Corner on radiosefarad, an Internet radio program originating in Madrid, Spain. Interview of Sonia by Ann Corcoran for then-MADY radio in Sarasota, FL (April 2, 2002). Sonia reads excerpts from her memoir dealing with her experiences growing up in the Catskill Mountains of New York State at the second 2nd annual conference of the Catskills Institute (Aug. 30—Sept. 2, 1996). June 12, 2018, interview of Sonia in Sarasota, FL about her relationship to the University of Miami School of Law (her law school alma mater) for its Oral History project by Anthony Stewart, Office of Law Development & Alumni Relations, Director of Development and Annual Giving, University of Miami School of Law. The interview runs 10-15 minutes. On Jan. 11, 2018, at a meeting of the Ladybugs, the Sarasota chapter of the Ninety-Nines, an international organization of women pilots, Sonia was interviewed by Elina Lunin, president of the Ladybugs. In February of 2018, Sonia and Elina were interviewed on Suncoast FYI by Nancy O'Neil of Sarasota TV station SNN, affiliated with the Sarasota Herald-Tribune. That interview went online on Feb. 9, 2018. Documentary film about abortion made in June 2017 by Carson Saflar, a California high school student, and three of his classmates. Carson is the grandson of longtime friends of Sonia's. Sonia was interviewed for the film and is quoted in it. Frequently, female students reach out to interview Sonia for projects they have in connection with National Women’s Month or a National Women’s History Day program. On January 26, 2017, Jennifer Cole, a 6th grader from Folsom, CA, interviewed Sonia for a documentary video she was making for a National Women’s History Day Competition about Betty Friedan (whom Sonia knew). Jennifer’s 10-minute video, Standing Up for the 51 Percent Minority, which quoted Sonia, won the county competition. After Sonia pointed out a number of errors in the video, Jennifer corrected some of them, but not all, and entered the revised video in the state competition, which was held on the weekend of May 6-7, 2017. She was a finalist in the state competition, but did not move on to the national competition. Her revised video is on Youtube. On Feb. 21, 2017, Sarasota TV Channel SNN (Suncoast News Network), seen in Sarasota and Manatee counties, showed the film of its staffer, Marco La Manna, interviewing Sonia. On Nov. 21, 2016, Sonia gave a 30-minute talk to the Holocaust Studies class at the Pine View School for the Gifted in Sarasota, FL. On Aug. 28, 2016, at 10:00 a.m., guest host Joan Lowery's 45-minute interview of Sonia was broadcast on radio program Milk & Honey, sponsored by the Jewish Federation of Sarasota-Manatee, on radio station WSRQ Talk Radio. Joan Lowery's interviews on Milk & Honey are Holocaust-related. The interview was also videotaped and sent to the Florida Holocaust Museum in St. Petersburg. Sonia's speech to WIN (Women in Nielsen) on June 16, 2015, on the women's rights movement at Nielsen's largest facility in the world in Oldsmar, FL. Interview of Sonia by Christa Whitney, director of the Wexler Oral History Project of the Yiddish Book Center in Amherst, MA. The interview, which focuses on Sonia's Jewish identity and her family, runs 1 hour and 51 minutes and was conducted in Sonia's condo in Sarasota, FL on Feb. 6, 2015. You can see a 7-minute excerpt of that interview dealing with the Red Star Line (RSL) and the RSL Museum. View the videotaped excerpt. On Oct. 23, 2014, at the IIT-Kent College of Law in Chicago, Sonia was a panelist at a program in Chicago by the EEOC (Equal Employment Opportunity Commission) commemorating the 50th anniversary of the passage of the Civil Rights Act of 1964, and, in particular Title VII of that Act, which prohibits discrimination in employment, and, more particularly, the early flight cabin attendant (stewardess) cases. On Feb. 26, 2014, Sonia and Judy Norsigian, executive director of Our Bodies Ourselves, were interviewed for thirty minutes by Luz Corcuera of Healthy Start--Bradenton on METV (Manatee Educational TV). Interview of Sonia by Beverly Newman of the Al Katz [Holocaust] Center in Sarasota, FL, for the Center's Oral Interviews of Holocaust Survivors Collection, May 13, 2013. Interview of Sonia by Catharine Skipp, Director of Media Relations, University of Miami School of Law, after Sonia gave a luncheon talk there to women faculty members and students on April 22, 2013. Fifteen-minute video of Sonia’s remarks on April 21, 2013, at the Jewish Museum of Florida in Miami Beach, Florida, on being one of five Jewish professional women in the State of Florida to receive the Glass Ceiling Award in 2013 for breaking the glass ceiling for herself and other women. YouTube clip on Sonia's role in the founding of NOW from a video by Jamie Spooner and Carolyn Mayes for the series The Wisdom of Elders Across America. Sonia and Richard Ohlsson were interviewed on METV (Manatee Educational TV) in Bradenton, FL on August 31, 2015, about the Ravensbrück Archive. This project to translate into English the interviews in Polish of 500 Polish women survivors of the Ravensbrück Concentration Camp, digitize those translations, and put them on the Internet so they will be available to the public has now been completed. A press release about it is at the Lund University website. Sonia appears in a one-hour documentary film about seniors called Whiskey and Apple Pie made by California filmmakers Jamie Spooner and Carolyn Hayes and released in 2012. You can see the film here. 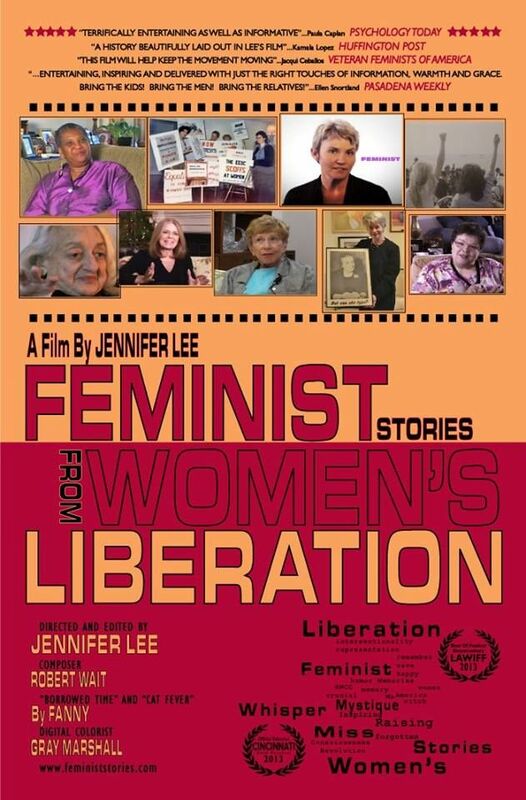 Sonia appears in the documentary film, Feminist: Stories from Women’s Liberation, by Jennifer Lee, released in March 2013. Sonia, discussing the founding of NOW (February, 2010). This interview was conducted by filmmakers Jamie Spooner and Carolyn Mayes in February 2010; their website is icarevillage.com.